We walked through the people and talked to some of the artists. Many were from Kansas and I believe it is safe to say that there was something hand made for just about everyone. I haven&apos;t been to such a diverse display of goods as this. Dishcloths, tie dyes, glass beaded jewelry, banks, leather works, you name it, I probably saw it. Desiree Warren, a vinyl artist captured my attention right away with her unique clocks. She is an Ottawa native, KU grad, who now lives in the Kansas City area. We talked a little bit about what she likes about Kansas, which is how pretty it is and how she can appreciate the fresh, smog-free smell of our state. After we finished browsing, we tried to pick a food vendor for lunch. It wasn&apos;t an easy task but I was pleased with a pork burger and sauerkraut that we found. Of course we had fresh-squeezed lemonade, caramel apples and the kids enjoyed hot dogs and kettle corn. I&apos;ve heard several mention the turkey legs and I can report that they smelled delicious. We left the fun downtown and headed east to what we heard was some sort of battlefield tour thinking we would do the self-guided option. We didn&apos;t have much information and despite the groans of the kids that almost had us turning around, we went anyway. As we pulled in, we were greeted immediately, but of course we were in the Travel Kansas van. It didn&apos;t take us long to change our minds about the self-guided tour. What we stumbled upon, and I have to admit it was quite accidental, was an interactive tour getting ready to begin. We learned about the Pearson Homestead that sits upon the property and the restoration project that has the home looking nearly new despite its age of 123 years, including green trim that matches the original paint. We were then led by our hostess to a trail where we were abandoned. Two gunshots, seconds from each other echoed through the woods. I jumped. 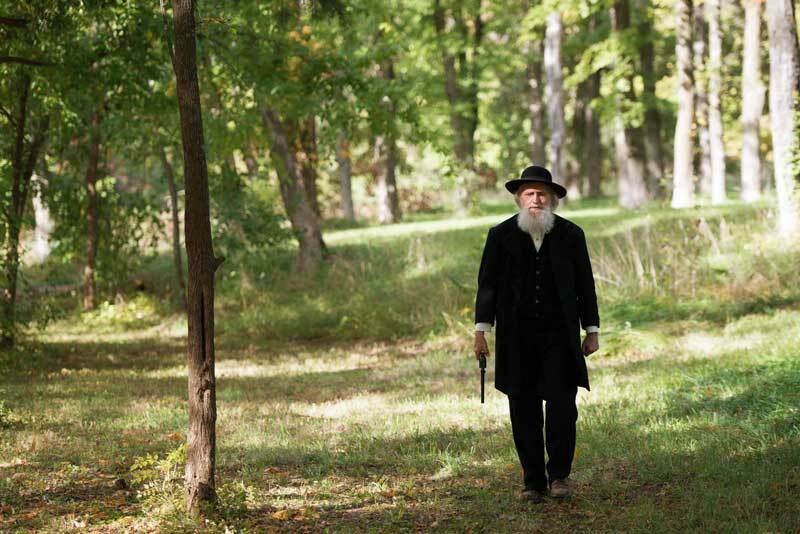 Henry Clay Pate and John Brown emerged to tell their story. Once again, Kansas was cradling information that I had no idea was out there. As with all of my other trips, just driving around I have discovered and learned so much more than what I had expected. Regarding the interactive tour, I feel this is a secret that needs to be set free. The performance was chilling, amazing and at times it was easy to believe I was listening to the real debaters themselves. It is said that this battle is the first in which slavery was fought over, sparking the Civil War. Information about this historic site and tours can be found at www.blackjackbattlefield.org. As I sign off for the season, I think about our day. Another Kansas festival. John Brown. History. Community. I think of my only purchase, a handful of candles. I haven&apos;t had a chance to light them yet, however the scent is escaping from the paper bag they are contained in, filling my living room with their aroma. I try to think about the day again as I try to dissect what each scent is, and what really comes to mind is "quality". Quality is just one of the many reasons I love buying hand made items from local shops, the farmer&apos;s market or festivals such as the Maple Leaf. They leave me smiling at the end of the day. Quality is in the way a community brings in people for over half a century and builds on tradition. Quality is expressed when volunteers donate time and resources to help us witness living history in an exceptional manner. Way to go Kansas on another successful day in the life. Baldwin City is also home to the Midland Railway and Baker University, which houses the Old Castle Museum.